(SACKVILLE, N.B.) – Atlantic University Sport has announced the 2015 football major award winners and all-stars as selected by the conference’s four head coaches following regular season play. The awards were announced at the 2015 AUS football banquet Friday evening on the Mount Allison University campus in Sackville, N.B. Tailback Ashton Dickson of the second-place StFX X-Men has been selected as the Atlantic University Sport outstanding player of the year. A fourth-year arts student in his fifth year of eligibility, Dickson led the AUS in all rushing categories this season, including carries (160), total rushing yards (866), yards per game (108.3) and average yards per rush (5.4). He also boasted the most rushing touchdowns with five on the season. The 5-foot-10, 195-lb Ottawa, Ont. native led the conference in all-purpose yards with 1,320 and average yards per game with 165.0. 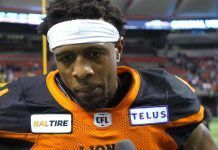 Along with his 866 rushing yards, he posted 157 yards receiving and 297 return yards. Dickson also led the Atlantic conference in kick returns with 14 for 297 yards, averaging 21.2 yards per return. He currently sits second overall in the AUS all-time record books in career rushing attempts with 683 and is fourth overall in career rushing yards with 3,178. He now holds the StFX school records in both categories. Dickson also sits second in the StFX record book and 11th in AUS history in career rushing touchdowns with 20 over his five-year career. In StFX’s Oct. 31 victory this season over the Mount Allison Mounties, Dickson broke the AUS single-game record for the most rushing attempts in a single game with 41. Most outstanding player honours were last awarded to a member of the X-Men in 2002 when former StFX standout Richard Karikari earned the award. Dickson now becomes the Atlantic conference nominee for the Hec Crighton Trophy as CIS outstanding player of the year. The honour has never been won by a member of the StFX X-Men. Former Saint Mary’s quarterback Erik Glavic and former Mount Allison star Eric Lapointe are the most recent Atlantic conference players to take home the Hec Crighton Trophy. Lapointe won the award both in 1996 and 1998 while Glavic was the 2007 recipient. The AUS rookie of the year is Mount Allison defensive lineman Donovan Glave. The 6-foot-1, 297-lb arts student from Brampton, Ont. played in all eight of the Mounties’ regular season games this year, en route to a 5-3 regular season record and a first-place finish in the conference standings. Glave posted 20 tackles this season – 14 solo and 12 assisted – averaging 2.5 tackles per game. The most recent player from the Mount Allison squad to earn AUS rookie of the year honours was Glave’s current teammate running back Chris Reid who earned the accolade last season. Mount Allison’s Sebastien Roy (1999) and StFX’s Jeremy Steeves (2001) are the most recent Atlantic conference winners of the Peter Gorman Trophy as the top rookie in CIS football. Acadia linebacker Drew Morris of Ottawa, Ont. has been named the AUS outstanding defensive player of the year. The fifth-year business student led the country in solo tackles this season with 47. He led the conference and was second in the country in total tackles with 58. His 8.3 tackles per game average was the highest in the AUS and third highest in the CIS. He was fifth in the conference in assisted tackles with 22. His stats this season also included 6.5 tackles for losses of 15 total yards, including a sack for a loss of five yards, as well as a fumble recovery. Morris now sits third in the AUS all-time record books for most career tackles with 222.0. He was also named a 2015 AUS football defensive all-star Friday. This is Morris’s third time earning a place on the AUS all-star squad. He was named to both the 2014 and 2012 all-star teams. He was also named a 2014 CIS second team all-Canadian. The last member of an Axemen team to earn the AUS outstanding defensive player of the year award was former Acadia standout Tom Labenski who earned the honour in 2011. Morris will now represent the conference as the AUS nominee for the Presidents’ Trophy awarded to the CIS outstanding defensive player of the year. No member of an Acadia Axemen team has ever won the national honour. The CIS award was last won by a player from the Atlantic conference last season when Saint Mary’s Jonathan Langa earned the honour. StFX X-Men head coach Gary Waterman has been chosen by his peers as the Atlantic conference coach of the year for the first time in his seven years at the helm of the X-Men program. Waterman led his StFX squad to a 5-3 regular season record this year and second place in the AUS regular season standings. 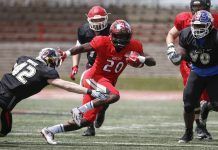 The X-Men earned the right to host the Subway AUS football semi-final matchup, in which they cruised to a 26-4 victory over the Acadia Axemen. Following their semifinal win, StFX will now appear in the Subway AUS Loney Bowl for the second consecutive season. This regular season, Waterman’s X-Men led the conference in rushing yards with 1,160 and were second in passing yards (1,720) and total offence (2,842). They also boasted the most interceptions in the AUS with eight this season. In the three seasons prior to his time as head coach, Waterman served as defensive coordinator with the X-Men. His hiring as head coach in 2009 marked the first time in StFX history that an alumnus has led the football program. Waterman played with the X-Men from 1988-1992 where he proved to be an impressive player on both sides of the ball, playing as a running back and a defensive back. A three-time AUS all-star, Waterman was named StFX MVP for three seasons and was a two-time captain of the X-Men. His win marks the first time AUS coach of the year honours have been awarded to a StFX coach since 2002 when former X-Men head coach Dennis McPhee earned the honour. Waterman now becomes the AUS nominee for the Frank Tindall Trophy awarded to the CIS coach of the year. Current head coach of the Mount Allison Mounties, Kelly Jeffrey, is the most recent AUS coach to receive the national honour, which he was awarded last season. John Stevens is the only StFX head coach to have ever earned the CIS award. He won the Frank Tindall Trophy in 1997. Defensive end Jesse St. James of the Acadia Axemen has been named the Atlantic University Sport outstanding lineman of the year for the second time in his AUS career. He first earned the honour in 2013. St. James, a 6-foot-2, 240-pound native of Pincourt, Que, led the AUS conference and was second in the country in both sacks (11) and sack yards (57). His 11 sacks tie him for the all-time AUS record for sacks in a season. His 31.5 career sacks are the second most in AUS history. St. James posted 30.5 tackles this regular season – 26 solo and nine assisted. These included 15.5 tackles for losses of 66 total yards. His stats also included three forced fumbles and a pass break up. St. James was named to the Atlantic conference’s all-star squad Friday evening for the third consecutive year. He was also named a CIS first-team all-Canadian in 2013 and 2014. St. James will represent the conference as the nominee for the J.P. Metras Trophy which was last brought back to the AUFC in 1997 when StFX’s Mike Kushnir was named the CIS’s top lineman. Acadia Axemen defensive back Will Wojcik of Ottawa, Ont. is the 2015 Atlantic University Sport student-athlete community service award recipient and will be the conference nominee for the prestigious Russ Jackson Award. Wojcik is a fourth-year kinesiology student in his fifth year of eligibility with the Axemen. In the classroom, he maintained a 4.0 GPA last season and has managed a 3.8 overall GPA so far at Acadia. This past summer he received the Honours Summer Research Award. He also represented Acadia at the 2015 Certified Society of Exercise Physiology conference in Hamilton, Ont. where he presented his honours project research. On the field, Wojcik played in seven of eight regular season games for the Axemen this year. He posted 24 tackles (20 solo and eight assisted), including two tackles for losses of 13 total yards. He also had two pass break ups. Wojcik was also heavily involved in his community this season, volunteering at Acadia with the Cardiac Rehab program, the Acadia Active Aging program, the Sensory Motor Instructional Leadership Experience (S.M.I.L.E.) and the Acadia High Performance Centre. He is the vice president and co-founder of the Exercise is Medicine club at Acadia and a member of the Acadia Players Association. He has also volunteered with his team for Run for the Cure and the Alzheimer’s donation drive. This is the second consecutive year a member of the Acadia Axemen has been awarded the student-athlete community service award. Wojcik’s former teammate Sean Stoqua earned the honour last season. The last AUS student-athlete to earn CIS honours in this category was Mount Allison’s Dan Parker who won the award in 2005. Bob Howes of the StFX X-Men is the 2015 recipient of the Phil Hughes Award as the Atlantic University Sport volunteer coach of the year. Howes, a native of Kirkland Lake, Ont., joined the X-Men coaching staff in 2013 as an offensive line coach. He moved to the defensive side of the ball as a defensive line coach this season. During his career as a player, Howes played basketball and football in the mid-1960s for Queen’s University under the legendary coach Frank Tindall (after whom the CIS coach of the year award is now named). Howes continued his university playing career at the University of Waterloo while earning a bachelor of education. A draft pick of the Calgary Stampeders, Howes then embarked on what would become a 14-year playing career with the CFL, suiting up first for the BC Lions and then for the Edmonton Eskimos. With Edmonton, Howes played in eight Grey Cup games and earned five championship rings from 1975 to 1981. In retirement, he became involved in CIS football again, coaching with the Queen’s Golden Gaels and then the University of Toronto Varsity Blues. He also spent several years volunteering in Kingston, Ont. as a coach with high school and community football programs before returning to the CIS in his current role with StFX.